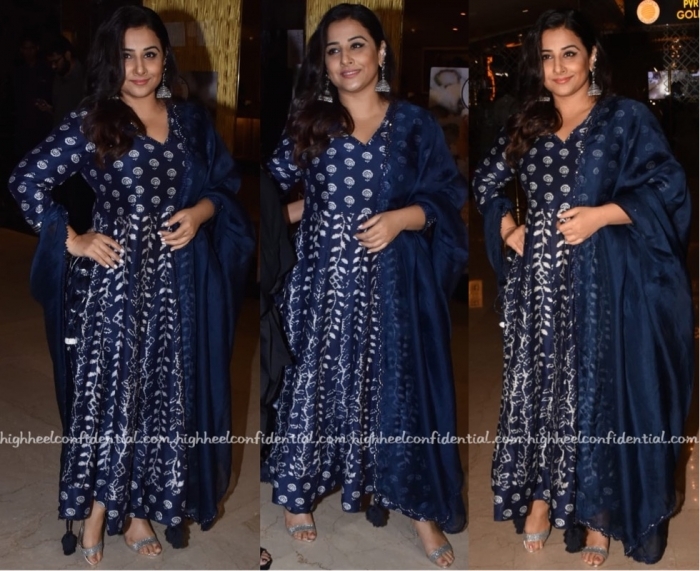 At the Critics Choice Film Awards nominations announcement event, Vidya was photographed in a Punit Balana suit. Silver earrings and pair of matching silver-toned sandals rounded out the actor’s look. She wore the look well. Patralekhaa picked plaid separates for her appearance at a recent awards event. Teaming them with an H&M belt and earrings, she rounded out the look with Saint Laurent pumps. Like what you see? P.S: Shop the Saint Laurent ‘Opyum’ pumps here. For their turn on the red carpet, Mrunal, Radhika and Tripti put their best foot forward in Karen Millen, Neeta Lulla and Alpana & Neeraj gowns respectively. 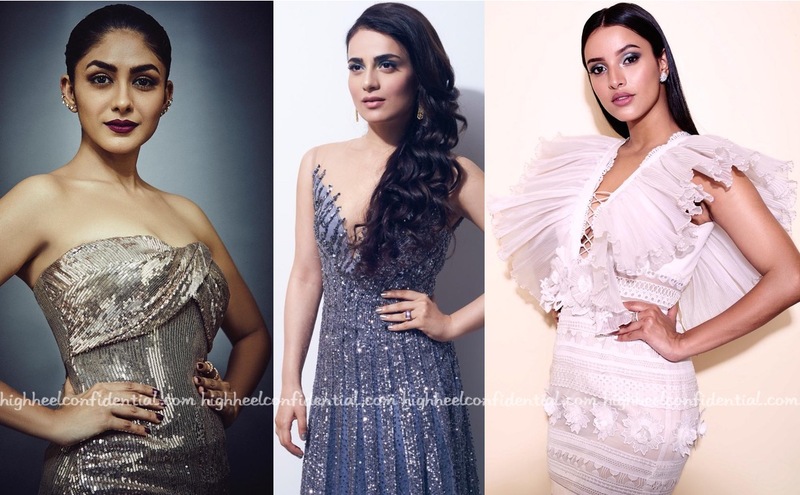 Which awards night look had your attention? Wearing a Varun Bahl sari, Vidya attended a movie screening recently. 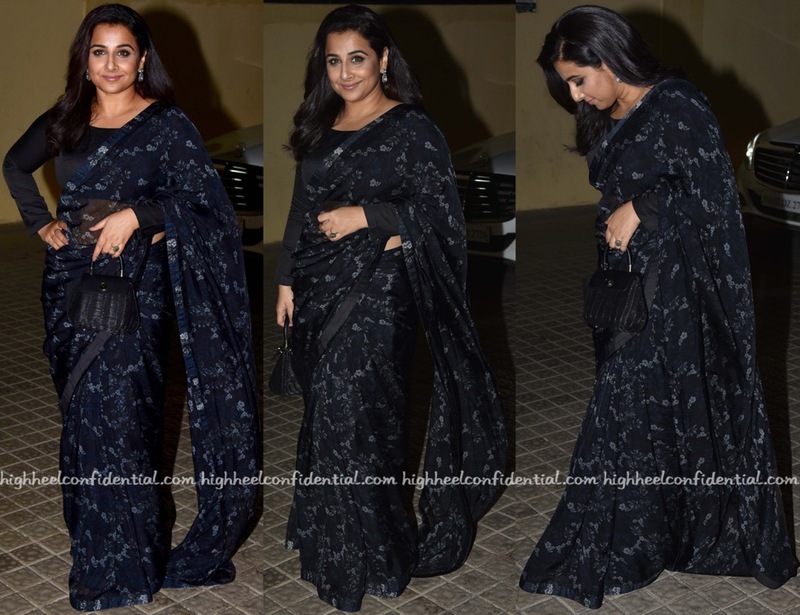 A black evening bag and Amrapali jewelry were among the actor’s accessories for the evening. She looked lovely. P.S: Does the sari remind anyone else of something out of Raw Mango’s ‘Midnight’ collection? At the launch of her second capsule collection for Hidesign, Kalki put in an appearance wearing Swapnil Shinde. A strong red lip, Radhika Agrawal earrings and metallic pumps rounded out her look. Not going in to the separates themselves, Kalki should’ve known the outfit wasn’t the best choice to showcase the bag that she carried to and posed with at the event.